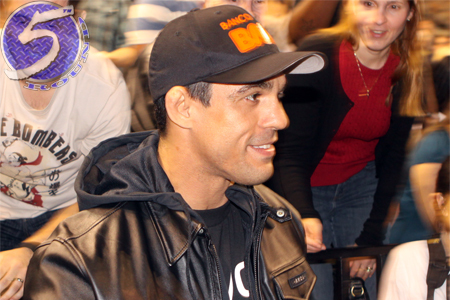 For the second time in as many fights, Vitor Belfort (pictured) put his opponent to sleep with a vicious head kick. In January, it was Michael Bisping who found himself on the business end of Belfort’s leg. On Saturday, it was former Strikeforce middleweight champ Luke Rockhold who was on the receiving end of a highlight reel strike. Jaragua Arena in Jaragua do Sul, Brazil hosted Saturday’s festivities.